This DogSpinny is one of the many board game-style puzzles by Nina Ottosson. These are basically the original dog games, I'm pretty sure she invented the concept and that other companies then copied her idea. I thnk they are the cutest puzzle games, and they are much higher quality than any of our others. The red disc covers eight bone-shaped compartments, and has a single opening that lines up with those. A single white bone-shaped cover sits in the opening and prevents the disc from turning until it has been removed. On the bottom of the toy, there is a single screw that holds the two parts together. This can be loosened or tightened to change the difficulty level, or removed completely to take the puzzle apart for cleaning. Nina Ottosson's website has a page of tips including the suggestion to fill the hollows with wet dog food and then freeze the base for a longer-lasting challenge. It was at this point I realized the puzzle must be designed to come apart, up until then I had only put dry food in it. Sisci is getting spayed today, so I will probably try out the frozen wet food idea soon. I expect a lot of our puzzles are going to be getting a lot of use during her recovery. Fits about 2 cups of food. This is a Level 1: Easy puzzle from Nina Ottosson, but it breaks newbie brains. They often need a break before they empty the whole thing. At least the first few times, the process has been lengthy and labor-intensive for Brisbane. The bone cover is light, and the disc can be loosened so it spins freely. This makes it suitable for the smallest dogs. Anything smaller than a giant breed ought to be able to get the food out of the hollows reasonably well, but I don't think a Saint Bernard would be able to use this one. 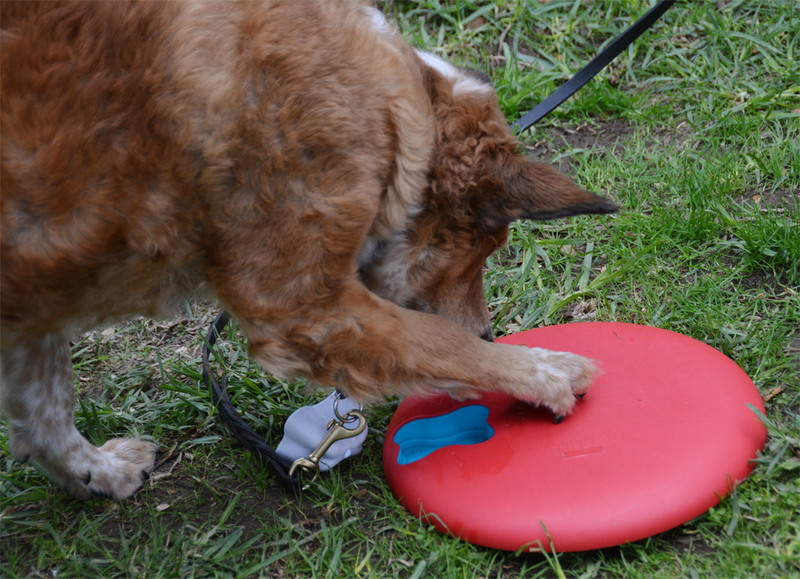 The DogSpinny is made from a slightly-flexible plastic that bends instead of cracking under stress. This means it should hold up well to being shot into walls by enthusiastic puzzle-solvers. That same material means it doesn't clatter nearly as much as the cheap, hard plastic puzzles. This is a supervision-only toy, so they never have a chance to shove it under the couch. Ok, I've had this thing for at least a year, and didn't realize it came apart until today. There's no uncleanable-spaces in it, and it's even dishwasher-safe. Crazy. The adjustable disc and light pieces mean this puzzle can be used by small animals like rats, ferrets, and rabbits. The fact that it can be opened and sterilized means it can be used by Xhuuya the raven, and other animals that tend to get their toys really egregiously dirty.